Everyone can exercise Nordic Walking with poles! Athletics, children and teenager, REHAB patients or persons that have the need of a long-term project for improving your quality of life, training with poles is an effective way. Functional Nordic Walking is one of the fastest growing recreational fitness activities worldwide and is an affordable and efficient way to improve your physical condition. Functional Nordic Walking Training for high performance training includes a variety of exercises that work on flexibility, core, balance, strength and power. Studies show that ordinary walking with poles increases fat-burn by up to 15%. Performances training with poles can easily double this figure. Interestingly, the degree of exertion you experience is lower with poles than without. So fitness benefits increase when using poles while requiring a lower level of exertion. 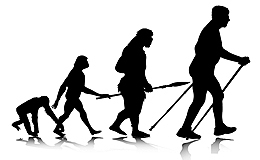 Functional Nordic Walking include a variety of exercises that work on flexibility, core, balance, strength and power. And it reduces the stress and weight on your joints while exercising, which makes it the ideal training method, even for persons with overweight. Functional training has its origins in rehabilitation. Physical therapists developed exercises for patients in order to return to their lives or jobs after an injury or surgery. The use of poles supports an upright and stable body position, which eases breathing and improves circulation, and helps release muscle tension associated with neck and shoulder. Both research and anecdotal evidence suggest that Functional Nordic Walking leads to better muscular balance and joint stability, which in turn results in fewer injuries and increased performance. Do you want to know more about Functional Nordic Walking, order our DVD or video now and let us inspire you to improve your fitness and well-being. It is wise to consult with a physician before starting any exercise program, especially if you are suffering from any cardiac disease, high blood pressure or have other medical issues.